Researchers at the Florey have invented a breakthrough imaging technique to describe in micro-detail the brain degeneration occurring in people with early Alzheimer’s and the full-blown disease. 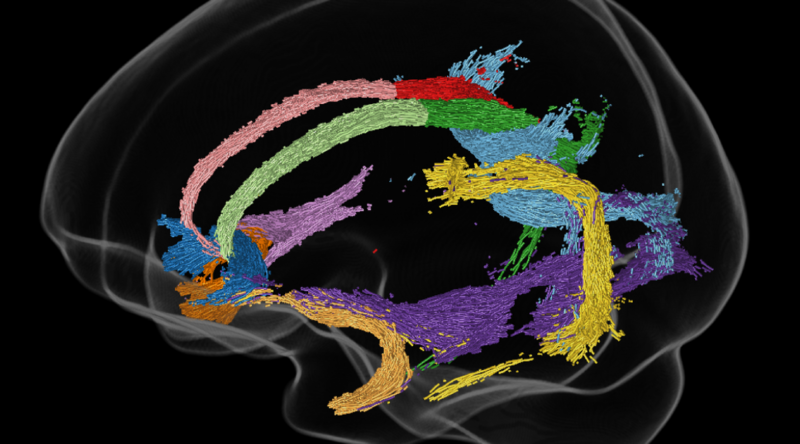 Using the Siemens 3T Trio scanner at the Florey node of the National Imaging Facility (NIF), researchers have identified the precise locations of brain degeneration in a cohort of living Alzheimer’s patients. The work is important as it sheds new light on the underlying cognitive degeneration in Alzheimer’s, helping us focus our efforts to slow the decline. To develop the technique, the team analysed brain scans from 177 Australians as part of the Australian Imaging, Biomarkers and Lifestyle study, who were either healthy, had an early form of Alzheimer’s or had the full-blown disease. The brain pathways identified by the team have all been implicated in Alzheimer’s disease previously; those known to be crucial for memory formation, emotion and reasoning. Alzheimer’s disease is usually thought to be caused by abnormal production and buildup of a peptide called amyloid beta. Professor Alan Connelly, who led the study, said, “Interestingly, the mildly affected patients with low amyloid had more fibre degeneration in particular brain regions than those with high amyloid levels. This suggests that firstly, specific degeneration of certain brain areas will not necessarily be useful in predicting which mildly impaired individuals will progress to Alzheimer’s disease, and secondly that degeneration of this pathway is related to cognitive impairment, regardless of the buildup of the amyloid peptide. “This is an important advance for a field still struggling to come to grips with what exactly causes Alzheimer’s. Our study shows we still have a way to go in interrogating the natural history of this insidious disease,” Alan says. Remika recently explained her results in an online abstract for Brain. If you would like to more about the details of the study, head over to Youtube to view Remika explain her work. This story was contributed by the Florey Institute of Neuroscience and Mental Health.